CRASH 13 - Here there be Monsters! The growth of the computer adventure games market in the latter part of 84 reflects the increasing interest of players in mind games and in fantasy games. It is probably the area where there is yet to be the most development of ideas, the uncharted continent of the psyche. In olden times when explorers were drawing maps, any large area they had been unable to visit and which remained a mystery to them was marked with the warning slogan, ‘Here there be monsters’. Now the world is well charted, but adventure game programmers and scenarists are busy keeping monsters alive and kicking deep inside our computers. Foremost in the development of fantasy role playing games, wargames and adventure games is Games Workshop, headed by writers Steve Jackson and Ian Livingstone. Roger Kean visited Steve Jackson at Games Workshop’s London headquarters and talked to him about the past, present and future. It is a timely moment to catch Steve Jackson, because any hint that his partner Ian Livingstone has been the busier of the two recently (with Ian’s involvement in Eureka!) is firmly squashed when you see what he is up to. There’s the latest in the Fighting Fantasy series of adventure game books just out, it’s called Talisman of Death, the fourth and final part of the Sorcery series just out, plans to turn the series into a computer game, probably to be released by Penguin, and he is hard at work on the first of a brand new series of computer games with a new concept which will be coming out through Adventure International under The Swordmaster name. On top of this, together with Ian Livingstone, Steve is busy running Games Workshop with its multitude of projects, which include several computer games for release during 85. I talked to Steve in his large but spartan office in the warehouse building that acts as Games Workshop’s head quarters in Park Royal, London. First off, I asked him how the whole thing had got going and why. ‘Ian and I both come from Manchester. We moved down here about twelve years ago and have never looked back. Originally we used to go to a wargame club in Manchester and I used to run a games club at the university of Keele. We got to know what was happening in games because people would come in and tell us things, so it soon became obvious we knew quite a lot about these games that nobody else had heard of. At the time Diplomacy was the big game, everybody used to play it by post and we played it in all night sessions, we also came across another called The Warlord. And then Avalon Hill wargames came out. Both of these places were in London, and the two wargaming friends realised that there was a market, especially when the role playing games began to grow in popularity. However, university finished and Steve and Ian went their separate ways. ‘I went off doing all sorts of different jobs, and then we all came together in London. Ian had moved down here with another friend and I’d just left a job looking after birds on a bird reserve. I came to London and the three of us shared this flat and that’s where Games Workshop was born. It’s a typical story really, one evening when we were really pissed off with all the jobs we were doing and it was getting up to Christmas, we got very drunk and we were talking about all these different things we could do, oh why don’t we start up a little spare time company, and so on. We got all enthusiastic about it and all the names came out, it was going to be Games Garage, and it was gonna be Megagames Experience and all these horrible things, and Games Workshop was down on this piece of paper somewhere and that was the one that stuck. It was about this time that the big break they had hoped for came in the shape of a new fantasy role playing board game from America called Dungeons & Dragons. ‘We were absolutely obsessive about it! I mean, it contained everything we wanted — it was wargaming and fantasy all rolled together into this totally unique game system that no one had ever done before, you could get totally involved in it. We dedicated weeks and weeks to it, designing dungeons, everything. Everyone goes through this thing — when you first discover it, it is your all encompassing passion, well for some people it is for the rest of their lives! But for us it was for about 6 months. Everyone we knew who was vaguely interested in fantasy we would invite them round to play this game, and they would get obsessed with it and the whole thing snowballed. Our first order was, I think, for three copies from the States, and they were gone within two days of the order going off. So we got more of them and we started selling them and they started doing well, and suddenly Games Day was featuring D&D. We started noticing other companies in the States who were producing similar things, so we went over to the States and signed a lot of them up with distribution deals. 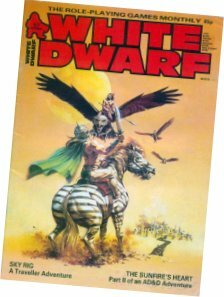 With the increasing experience gained by writing for Owl and Weasel and then in White Dwarf both Steve and Ian felt they were ready to tackle something a bit bigger, something that would involve them more creatively, and it came with the Fighting Fantasy books. The two synopses sat around at Penguin for ages until Steve thought that Penguin had given up on them, but one day they received a phone call. The project was on. ‘They had us in and there was Puffin and Penguin fighting over us — this was Warlock of Firetop Mountain. The problem was Puffin was saying I think it ought to be a children’s book and Geraldine was saying no, no it ought to be an adult’s book because it’s adults that play these games. And it went back and forth and they asked us what we thought, and we said, we’ll leave it to you. ‘Eventually Puffin got it, and it got written, and it was a real pain to write. It’s one thing to do these little things, but it’s another thing to do a whole book. It’s all got to branch out then come back in. We split it between us and the way we did it was that Ian did the first half of the book and I did the second half. We spent about three months doing this, typing it, it was really new writing books, so we got all this work done for the deadline and took it in and two days later Penguin were saying that they couldn’t do anything with it. Our writing styles were completely different, well Ian had lots more encounters with rooms, puzzles and traps and so on, whereas I hadn’t got anything like as many encounters, there were more things to do. Penguin felt that there was a real sense of moving from one into the other, so we had to go back and rewrite the whole thing and also work out the combat system which we hadn’t agreed on. Anyway, it all got done and eventually came out as Warlock is now. 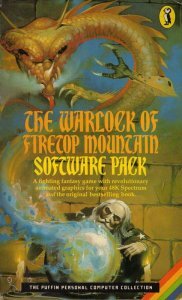 The Warlock of Firetop Mountain was published in August 82 and promptly sold out its first print run in three weeks. Penguin immediately asked whether it couldn’t be turned into a series and so Fighting Fantasy was born. Their experiences at writing together led Steve and Ian to writing on their own, which was hardly any slower, and the series grew. Other authors have since been drafted, and now the 11th book in the series (Talisman of Death) is out. Neither Steve nor Ian are computer programmers, although Steve has certainly had a go. The expert in question was Rob Easterby, another PET freak who had produced an early version of the Star Trek trench game. ‘I know it’s old hat now, but at the time nobody had ever done that. And if you look at the graphics now compared to what you get today — well it was just about 8K! But it was quite a good game and everybody who came along to Games Day enjoyed it, and we released this range of six games and arranged quite a bit of advertising for them, and they bombed out completely. It was a terrible disaster! All the copies we made were on our own little PET. That was our best selling game and I think we sold about 60 of them! That was the state of the computer games market. We consoled ourselves with the fact that at least we could say we were ahead of the time. 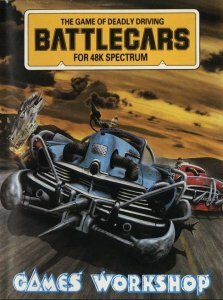 It’s all happened since, but the experience made us think that if we were going back into this again, we’ve got to make sure we do it well.’ Although it was released under Penguin/Puffin’s imprint, the first of the ‘new generation’ Games Workshop computer games was taken from their best-selling Warlock of Firetop Mountain. It was programmed by Crystal. Was Steve happy with it at the time, and how did he get Crystal to do it? ‘I think I can say this safely now, there was a time when I shouldn’t have said this. The Warlock of Firetop Mountain computer game happened because Ian and I went up to Manchester to do a book fair at the library and afterwards I was buying a birthday present for my mother from Argus. And there was a queue and I had all these little leaflets under my arm — ‘Introduction to Fantasy Games’ — and Chris Clarke from Crystal was in the queue behind me, and he noticed the leaflets and said, Oh Introduction to Fantasy Games, and I said, oh do you want one? So we got talking, and he told me that they write computer games and how they have a game that knocks The Hobbit on the head and the graphics are fantastic and it works in real time. And I said, that’s interesting, we’re looking for a computer game which would fit the Warlock of Firetop Mountain. So they came down to London and showed us their Halls of The Things and it looked pretty good. Penguin more or less left it in our hands when we recommended this highly because it looked pretty good, state of the art as far as arcade games went, but there were things we wanted them to do — like, can you take away the maze? We don’t want a maze any more, we want corridors that open up, a bit like the D&D game on Intelevision. Yes that was no problem, and change things like magic spells — they had lightning bolts, we just wanted a sword, and the monsters should be stationed in rooms, so you’ve actually got to enter a room and it becomes more like Warlock. But despite all these suggestions that we made, in the end the game that came out was a sort of version of Halls of the Things. Even basic things they hadn’t changed like it’s got strength, they hadn’t changed that to stamina. It was a case of coming up to Christmas, and Penguin had paid their advance, so poor Phillipa at Penguin, who is a real hero, went up there and supposedly got an awful lot done with them, and even then it was late, so she ended up giving them a deadline that if it isn’t in by next Monday the game’s not coming out. And the minute it was in at Penguin it got tested and it was off for duplication into production copies. And then we said, oh let’s have a look at this thing, and we said, oh this isn’t anything like we said it was supposed to be like. 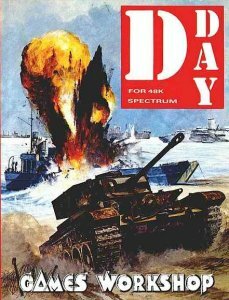 Games Workshop released three programs under its own imprint, the wargame D-Day, the role playing strategy of Battlecars and the Quilled adventure Tower of Despair. 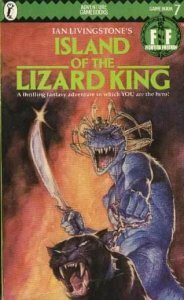 The two most recent releases are also from the Fighting Fantasy series of books, numbers 2 and 3, Citadel of Chaos and Forest of Doom, which are more or less straightforward computer adaptions of the books. But Steve has recently been pursuing his own ideas further in computer games. ‘I’ve suddenly discovered what you can do with computer games on the adventure side. They can be so much more varied than in the books. You can keep so much hidden, although they’ll never replace the literary side of a book, that you can describe so much in a book. It’s horses for courses really — if you want to read and get involved in a story I’d much rather do that in a book than in a straight adventure game. But what you can do with computer is incredible. It probably all sounds a bit old hat! But ever since I started thinking about The Swordmaster thing and the Sorcery thing, I started thinking, oh well computers can do that, you can’t do that in a book. So there’s really lots of new ideas here. Computer adventures have come a long way since then, and Steve’s main preoccupation at the moment is the development of Sorcery and The Swordmaster series for Adventure International. Sorcery has been developed from his quartet of books of the same name. I asked him where the idea had come from. ‘I went on holiday in Nepal in 82, just after Warlock was published and it was just such a good place to go then — I mean my head was full of Warlock and working out these fighting fantasy books and suddenly I wound up in Nepal which was such an inspiring country for fantasy. Tolkien based The Hobbit and Lord of The Rings in Nepal. We went on this trek through the hills and came across these people who are just like Hobbits, you know, they’re small and squat and have hairy feet and they always smile. You go trekking around these hills, there are no roads, everything is transported on their backs and you can just imagine monsters being around in the hills. That was where Sorcery came from. I thought, this has got to make a book. ‘Sorcery the computer game is going to be sort of like the book, but not quite. It’s got a lot of new things in it, it’s not just got the text stuck onto the computer, because the thing about Sorcery is that it’s a series of four books that go together taking you right across this kingdom here. What is different about Sorcery, apart from the fact that it is four linked books and you can carry the character you play over from one to the other, is the way the spells work. Originally there was a spell book with it, but they decided to include it in the book. Each of the 48 different spells is identified with a codeword which is related to the spell and you practice this, you do it on a bus, and then you start the adventure, and you can’t look at the spell book once you’ve started the adventure, so when you get to a place when you can use a spell you’ve got to remember what HOB means, and if you can’t remember what HOB means and you just choose it, then the chances are that that things will go badly wrong. ‘I was very disappointed with it at first, it’s been going about a year and a half now, came out as a Penguin initially, now it’s under Puffin, but now, number three has gotg to third place in the children’s book chart. The company doing the actual programming for Sorcery is Scribos, two professional programmers who have done a lot of the Penguin study software. They have never done games before but Steve has been very pleased with their presentations so far. 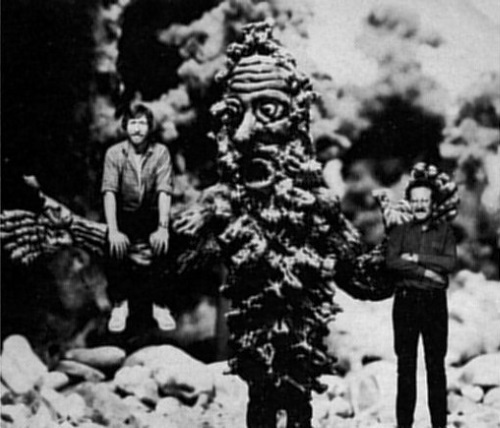 Some of the ideas Steve Jackson has had for including more graphics in computer adventure games have evolved from his writing background. The Fighting Fantasy books are an obvious departure point and a text-only adventure is an obvious outcome, but the probems start when you want complex graphics and a complex program that can cope with the sort of ideas he has developed for the book versions. Tables for spell casting and for combat encounters start to get out of hand with available memory, especially if there is to be location and character description and graphics. How to overcome the problem? It may well be that a new game, released by Adventure International and with a scenario by Steve Jackson, will provide the answer. It will be the first of a planned series under the general heading of The Swordmaster. How the idea first evolved is a story in itself, here Steve recalls the events of some years back. ‘A long time ago, while I was working on Sorcery in fact — I went over to the States. We’ve got an office over there, and John, the fellow who actually runs it, he and I were in Washington looking around for sites for an office. It was a Sunday morning, he borrowed the car we had hired and I was left in this bed and breakfast place, right at the top in an attic. Now I only had normal clothes, just a jacket and ordinary shoes, you know, and it had been snowing the night before, and it didn’t stop. It was feet deep, so I couldn’t go out. The nearest shop was at least ten minutes away, and I didn’t have any money either because I had given some to John as he was going off to see his family and left myself with about a dollar. So I sat down and thought what am I going to do? I’ve got no money for food, I cant go out anywhere — and this thing came up and this is what became Swordmaster eventually. ‘It was a combat system in which you learn how to fight and you gain experience and originally it was going to be a part of Sorcery. I thought that’s great, you’ve got this new spell system that’s never been used in a Fighting Fantasy book and you’ve got this new combat system as well. But it became a bit too complicated to include with everything else and I didn’t want the books to get that complicated. So the idea sat around and then Games Workshop were going to use it for a solo fantasy role playing system but we couldn’t decide whether it was going into a book or into a box game and eventually nobody ever did anything with it. ‘The way it works is that for every monster you come across you have a series of numbers. It’s not really complicated, but it sounds it to explain. You’ve got different numbers for different monsters, the numbers are on a sliding table, so that number 20 might be, ‘Leaps at you and attacks’. So you choose your own move (you can do certain things, depending on what you’ve done before) and you cross index these two on the scale and if you leap on him and attack and he leaps on you and attacks then you both do damage to each other. But if you’re defending and he leaps on you to attack, then he doesn’t do any damage, to you. You can actually learn what the numbers mean, and that was the main idea — that you would learn what the numbers mean. It’s a very flexible system because different monsters have different characters, that’s part of it as well — there are some monsters that will race at you and attack and then get tired out and have to rest and that’s when you can do your thing and go into the attack. So you’ve got different characters that you can build up. And because you learn it, it’s very much like real fighting. 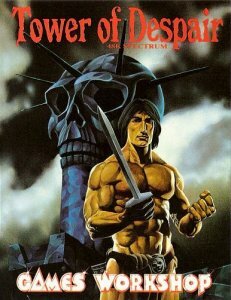 So sitting alone in his foreign snow-bound tower Steve Jackson had planned out a novel combat system which was to sit on a shelf for quite a while until Mike Woodruff from Adventure International came along. It sounded like a good idea, Adventure International would be freed of memory-wasting description and able to concentrate on strong graphics while Steve would be free to write in as atmospheric a style as he wanted. It also occurred to him, that he had an entirely unused combat system which had been sitting around for two years doing. ‘I thought this is all numbers so it would be perfect for a computer. Mike came round to my place and we went through a couple of combat routines and it worked well. Mike played it again and said, yes that’s all right. So he put a programmer on it. In effect this is a logical development of the Fighting Fantasy books, but it has a distinct advantage over them, as Steve points out. At the time of writing (just before Christmas) Mike Woodruff and his team are still putting the finishing touches to the first program in the series which is called Isodene’s Keep. There have been delays in the schedule, but Steve seems unworried by this and is excited by the way things are going. Mike Woodruff is also excited by the idea. I spoke to him some time after talking to Steve, when development on Isodene’s Keep was more advanced. He told me, ‘You don’t see the combat system calculations on screen, that’s all done automatically as are the updates after a combat. Up to six characters are controllable by the player, or by six players if desired. The monsters are all animated. We have taken our comic strip style graphics even further — the monsters have animated claws, eyes, noses and their tails thrash about. ‘At the top left of the screen messages appear telling you which paragraph to look up in the book. There you’ll see a description of the location, and on screen you’ll be told what movable objects are there such as treasures or traps. The exciting thing is that each game will be different as monsters, treasures and traps are all relocated with every game. So the package will be a book and a tape. The series won’t have a common tape with it because the graphics will be modified each time to suit the storyline; and although the fighting system, which is a large chunk of the database, will remain much the same, both Steve and Mike say they are aware of the development possibilities of this very flexible system. Steve says, ‘I’m not a programmer so I don’t know how much they’re going to be able to get in of all this stuff. You can also carry your character on from one game to another, at least that’s the plan.’ Isodene’s Keep is due for release at the end of January, beginning of February and at the time of writing, Adventure International are hoping it will cost £9.95, but the final price will depend very much on the costs of printing the paperback book to go with it. The second in the Swordmaster series will be available a month later, titled Guardians of the Frozen Tower. Adventure International have a two year contract with Steve Jackson to produce a whole series of Swordmaster games, and it will be fascinating to see the development of the ideas outlined above as the series progresses.